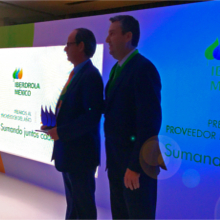 Iberdrola, one of the major electricity companies in the world, has recognized the Arteche Group once again, this time in Mexico, as the Best Supplier of the Year 2017 in the Innovation and Competitiveness category. This award is added to the Supplier of the Year Award in Spain. Since Iberdrola launched its first expansion in the Latin American market, Arteche, with over 30 years of presence in Mexico, has accompanied the company, offering new solutions to the new challenges that arise.